Located in Santa Monica, CA Medical Homecare Hospital Bed. ($640 new). Adjustable with remote control or manually. In great condition. https://www.drivemedical.com/index.php/deltatm-ultra-light-1000-semi-electric-bed.html Also comes with 2 mattresses - 1. Drive Premium Guard Gel Overlay ($315 new) 2. 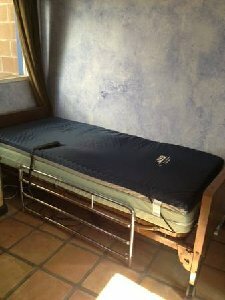 Standard Homecare Mattress ($200 new) Total cost new = $1,165 $250 OBO.